Phototropin protein, with chromophores in blue. Portions that are not included in the PDB entries are shown with schematic dots. Scientists have known for many years that plants respond to light, growing toward sources of light and protecting themselves from light that is too harsh. In many of these cases, plants are responding to the level of blue light. Blue light has several advantages over other colors. It is among the most energetic of the visible colors, and thus can have a greater effect on chromophore molecules that absorb light. For plants that live in water, blue light also penetrates deeper than other colors. Plants, as well many other types of organisms, use sensor proteins to see the level of blue light and respond to it. The light-sensing protein shown here is phototropin, found in many types of plants. It is important for responses that maximize the efficiency of photosynthesis, such as relocation of chloroplasts to optimal positions and expansion of leaves. Phototropin is composed of several domains. Two of these domains, termed "LOV" domains (short for "light, oxygen, or voltage"), hold flavin chromophores (shown in blue) that absorb blue light. These domains are connected to a serine-threonine kinase, which propagates the signal when the LOV domains are activated. There is not yet a structure of the entire protein, so the LOV domains are shown from PDB entries 2z6c and 4hhd , and the kinase domain is modeled on a similar kinase in PDB entry 1atp . The light-sensing LOV domains are very modular, and scientists have engineered them in several ways, attaching them to other proteins and tuning the light that they absorb. For instance, the PDB includes a custom light sensor created by fusing a LOV domain with a different type of sensory kinase (PDB entry 4gcz ) and an engineered LOV domain that improves the fluorescence, for use in labeling molecules in living cells (PDB entry 4eeu ). 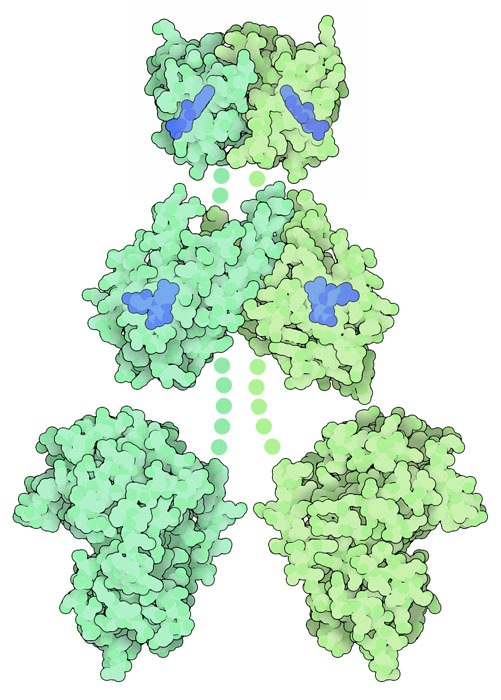 Vivid protein, with the chromophore in blue. 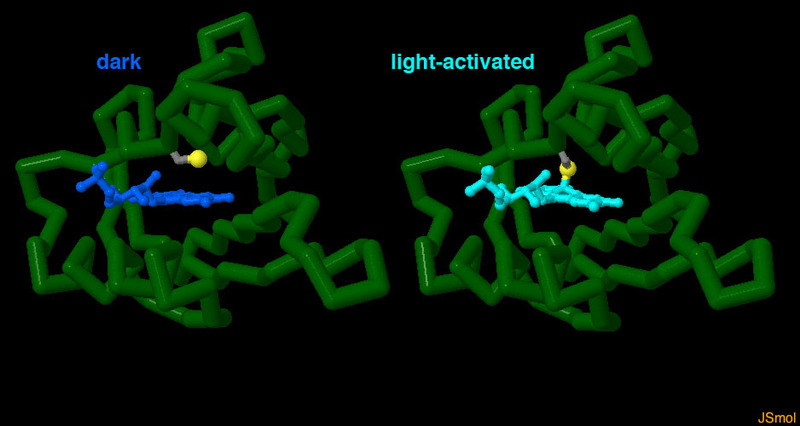 When the flavin chromophore absorbs light, the surrounding protein passes the signal along, ultimately changing how the plant will respond. For phototropin, the signal is passed to the kinase domain, which modifies other signaling proteins in the cell. The details are still under study, but some clues to the signaling process have been uncovered in the blue-light sensor Vivid, which is found in fungi. It is simpler than phototropin, with only a single LOV domain. In the dark, it is a monomer, shown here from PDB entry 2pd7 . When the chromophore absorbs light, it causes an alpha helix on the surface of the protein (shown in brighter colors here) to shift, causing the whole protein to dimerize, shown here from PDB entry 3rh8 . Scientists have solved structures of the phototropin LOV domains, as well as other blue-light sensing proteins, in both the dark and after they absorb light. In phototropin, the photo-activated flavin reacts with a nearby cysteine amino acid, forming a covalent bond. This distorts the flavin ring, and also distorts the surrounding protein. The two structures are available in PDB entries 1g28 and 1jnu . Click on the image to explore these structures in an interactive JSmol. 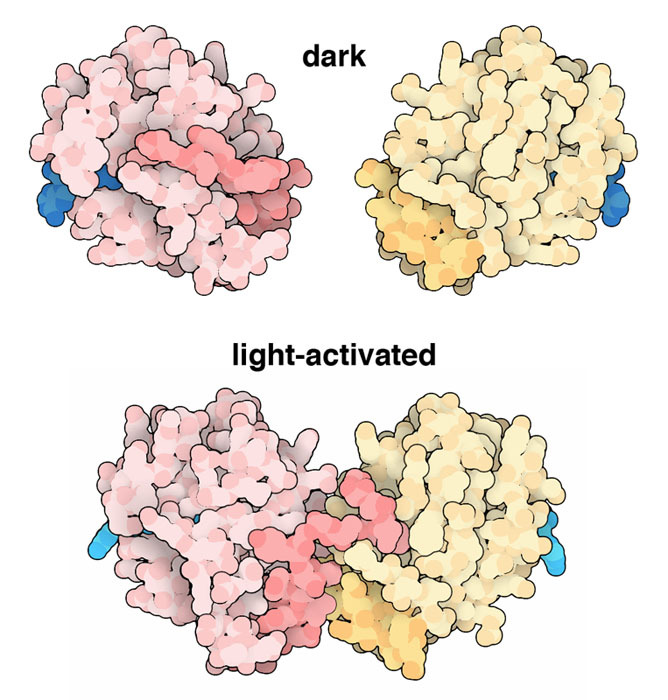 There are many other structures for proteins that sense blue light. To see other proteins like phototropin, try searching the PDB for "LOV," and to see other types of proteins, search for "cryptochrome" or "BLUF." Flavins are also used as electron-carrying cofactors in many enzymatic reactions. You can search for "FAD" to find examples in the PDB. You can use the "Protein Feature View" to see how the different domains of phototropin fit together, for instance, in the view of Arabidopsis phototropin. K. S. Conrad, C. C. Manahan & B. R. Crane (2014) Photochemistry of flavoprotein light sensors. Nature Chemical Biology 10, 801-809. 4gcz: R. P. Diensthuber, M. Bommer, T. Gleichmann & A. Moglich (2013) Full-length structure of a sensor histidine kinase pinpoints coaxial coiled coils as signal transducers and modulators. Structure 21, 1127-1136. 4hhd: A. S. Halavaty & K. Moffat (2013) Coiled-coil dimerization of the LOV2 domain of the blue-light photoreceptor phototropin 1 from Arabidopsis thaliana. Acta Crystallographica F69, 1316-1321. 4eeu: J. M. Christie, K. Hitomi, A. S. Arvai, K. A. Hartfield, M. Mettlen, A. J. Pratt, J. A. Tainer & E. D. Getzoff (2012) Structural tuning of the fluorescent protein iLOV for improved photostability. Journal of Biological Chemistry 287, 22295-22304. A. Losi and W. Gartner (2011) Old chromophores, new photoactivation paradigms, trendy applications: flavins in blue light-sensing photoreceptors. Photochemistry and Photobiology 87, 491-510. 3rh8: A. T. Vaidya, C. H. Chen, J. C. Dunlap, J. J. Loros & B. R. Crane (2011) Structure of a light-activated LOV protein dimer that regulates transcription. Science Signaling 4, ra50. 2z6c: M. Nakasako, K. Zikihara, D. Matsuoka, H. Katsura & S. Tokutomi (2008) Structural basis of the LOV1 dimerization of Arabidopsis phototropins 1 and 2. Journal of Molecular Biology 381, 718-733. 2pd7: B. D. Zoltowski, C. Schwerdtfeger, J. Widom, J. J. Loros, A. M. Bilwes, J. C. Dunlap & B. R. Crane. (2007) Conformational switching in the fungal light sensor Vivid. Science 316, 1054-1057. 1jnu: S. Crosson & K. Moffat (2002) Photoexcited structure of a plant photoreceptor domain reveals a light-driven molecular switch. The Plant Cell 14, 1067-1075. 1g28: S. Crosson & K. Moffat (2001) Structure of a flavin-binding plant photoreceptor domain: insights into light-mediated signal transduction. Proceedings of the National Academy of Sciences USA 98, 2995-3000.